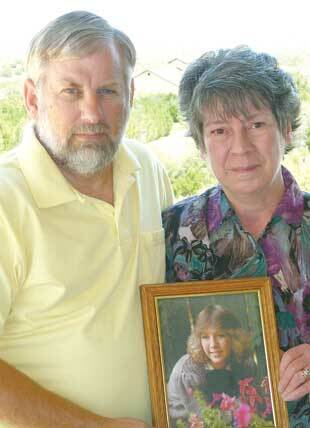 Ron and Sheila Kimmell pose recently with the familiar photo of their slain daughter. Now, 17 years after Lisa Marie Kimmells abduction and murder, Sheila is releasing a book about the familys journey through tragedy and enduring a long wait for justice. Sheila Kimmell wasn't sure what to think when a Madison Avenue publishing executive said it would be cathartic for her to write a book about the horrifying death of her daughter. Kimmell wasn't looking for a catharsis 17 years after her daughter was abducted and murdered in Wyoming while driving home to Billings from Denver. Kimmell knew that putting the painful details of Lisa Marie Kimmell's final days on paper would not put an end to her own pain. "In the real world, for somebody who's experienced something like this, there is no closure," Kimmell said. Writing and publishing "The Murder of Lil Miss" wasn't about healing, Kimmell said. It was about sharing her family's journey through tragedy. And it was an attempt to say thank you, she said, to all the people who knew Lisa and still mourn her death and to those who never met Lisa but who showed kindness to the Kimmells in their loss. "They were the legion of angels that supported us through this tragic event," Kimmell said. Sheila's husband, Ron, said he hopes the book answers any lingering questions about their family and how they coped with their daughter's death. "We're not writers," he said. "We just happen to be a family that lived through a tragedy that people want to know about. The people who have followed this all these years deserve to know everything there is to know about it." The Murder of 'Lil Miss' The life and death of Lisa Marie Kimmell. Click here. After a year of writing and editing, Sheila Kimmell's book will be released this month. Kimmell self-published the 244-page paperback with help from The Floating Gallery, a New York City publishing company that specializes in independent projects. Writing the story of her daughter's murder and the long hunt to catch and convict her killer was a daunting job, Kimmell said. There were hours of telephone interviews with Kay Carpenter, a professional writer in North Carolina hired to assist with the book. The women had long discussions about the focus of the book, the details of the crime, the investigation that spanned more than a decade and the trial last year that resulted in a death sentence for Lisa's killer, Dale Wayne Eaton. At one point, Kimmell and Carpenter disagreed on how much information about Eaton's past should be included in the book. "When Kay felt that was an element, my first comment was, 'I don't give a damn about Dale Eaton,' " Kimmell said. There were long hours of rewrites and editing and moments where the only way to get the story right was to relive painful memories. She got through those times, Kimmell said, by allowing herself to step away from the project when she could no longer work through the tears. "There were times I could stand back and be objective and other times I just couldn't," she said. "There are still areas that I can go back and, as I review the book, I can't help it, I just cry. It's just there. I guess it would be a real sad commentary on my daughter's life if I didn't feel that way. Even though it's been time, a lot of years, it just doesn't really go away." Lisa Kimmell was raised in Billings and graduated from Senior High School in 1987. A few months later, she went to work with her mother in Colorado. Sheila Kimmell was a regional manager for Arby's, and Lisa also worked for the company. They shared an apartment. Lisa disappeared on March 25, 1988, while driving to Billings from Denver in her new sports car, a black Honda CRX with a customized license plate, "Lil Miss." The Kimmells launched a frantic search for their missing daughter. A week later, the 18-year-old woman's body was found in the North Platte River west of Casper, Wyo. She had been raped, bludgeoned and stabbed. Lisa's car, with its distinctive license, was not found despite a nationwide search. The media carried the story of Lisa's disappearance and murder across the country. When the investigation stalled and years passed without an arrest, the case was featured on the television series "Unsolved Mysteries" and later on "Cold Case Files." A year after Lisa's death, the Kimmell family moved from Billings to Colorado. Sheila Kimmell said she was always amazed at the attention and interest her daughter's case generated. Over the years, the family received letters, telephone calls and e-mails from people across the continent and from as far away as Germany. "Lil Miss has become such a wide-known moniker," she said. "People wanted to know more about this pretty little girl in the picture that everybody has seen." Many people also wanted to know how the Kimmell family coped with the loss. "We met a lot of people who have had similar situations who didn't get the publicity," Ron Kimmell said. Sheila Kimmell said she recalls the first suggestion someone made to her about writing a book. It came about 10 years ago, she said, from federal agent investigating the case after a frustrating meeting with local law-enforcement officials in Wyoming. Over the years, others familiar with the case also suggested that she should write a book about her family's story. Sheila Kimmell didn't give the idea serious thought until three years ago, when an unexpected breakthrough pushed case into the national news again. In 2002, investigators got a hit on foreign DNA that had been found with Lisa's body. The DNA was matched to Eaton, who was serving time in a federal prison in Colorado. Investigators soon were digging up Eaton's property in Moneta, Wyo., where they found Lisa's black sports car buried. A piece of the "Lil Miss" license plate was found with the car. Eaton was charged a few months later, and, after a trial last year, Eaton, a divorced drifter, was sentenced to death. The book became real about a year before the trial started, Sheila Kimmell said. She had retired and was preparing to face the trial. A few months before the trial started, she contacted The Floating Gallery and signed a contract. Interest in the case and the Kimmell family peaked during the trial, she said. "How did our family cope with all of the things we had to cope with, both on the emotional basis, but then also through the process of the twists and turns and the ironies of 14 years of investigations and some of the bureaucratic and jurisdictional red tape?" she asked. Sheila Kimmell said she knew she couldn't write the book until after Eaton's trial. And, although she had some writing experience as a corporate executive, she also knew she would need some help. The publishing company found Carpenter. Despite the distance between them, Kimmell and Carpenter worked well together, they said. Shortly before the trial, Sheila Kimmell sent a box full of newspaper clippings, her journal and other material to Carpenter in Asheville, N.C., where she lives. Carpenter was excited to be involved in the book project and flew to Wyoming to attend some of Eaton's trial. Not long after Eaton was convicted, work on the book started. As Carpenter and Kimmell talked by telephone, Carpenter recorded the conversations and turned them into material for the book. "Sheila did a lot of talking, and I did a lot of listening and a lot of writing," Carpenter said. As with Kimmell, Carpenter said there were times when writing Lisa's story was overwhelming. "We would be talking, and she would start crying and I would start crying and we would say, 'Let's take a break,' " Carpenter said. Fascinated by the speculation of some criminal experts that Eaton may be a serial killer, Carpenter said she lobbied Kimmell to include more information about the man in her book. Eaton has not been charged with any other murders, but at least one expert on serial crimes has said he fits the profile of a serial killer. The expert, former FBI profiler Greg Cooper, also wrote a chapter for Kimmell's book. The unsolved murders of four other women with possible links to Eaton are discussed. "What does a sociopath look like?" Carpenter said of Eaton. "This is what it looks like." Kimmell was reluctant at first to include much information at all about her daughter's killer, let alone devote chapters of her book to him. The debate eventually focused on whether to include letters Eaton wrote before his arrest for Lisa's murder. Another decision was whether to use a note found on Lisa's grave in Billings signed by someone who identified himself as "Stringfellow Hawke," a character from a 1980s television series. An Easter poem written by two Billings boys left at the Kimmells' door the year Lisa died also was debated by Kimmell and Carpenter. The issue was finally decided when five people who reviewed a draft of the book late last year agreed with Carpenter that the Eaton letters and the note left at Lisa's grave should be included. "I said, 'OK, you win, but I keep the Easter poem,' " Kimmell said. Kimmell said there have been other challenges to getting her book into print, most of it due to her own inexperience on such a project. Details such as the book cover, page design, marketing and distribution have all proved interesting, she said. In mid-June, Sheila Kimmell said she finally learned that her first order for 2,000 copies of the book would be off the printer the first week of July. She has scheduled a book signing at Borders Books in Billings on July 23. Similar signings are scheduled in Denver and Casper, she said. Kimmell said it is not her goal to profit from selling the story of her daughter's murder. She said she has invested about $30,000 into the book project and hopes to at least break even. The purpose of the book, she said, is to answer any questions about Lisa and how her family survived her slaying and to show that the man who killed Lisa could be responsible for several similar crimes. "I've always had to believe there has to be some kind of good, and we've had a lot of good, even out of this tragedy," Kimmell said. Greg Tuttle can be reached at 657-1230 or at gtuttle@billingsgazette.com.